The board is responsible for ensuring that the organization is appropriately stewarding the resources entrusted to it and following all legal and ethical standards. A board has a fundamental, legal responsibility to provide oversight and accountability for the organization. Referred to as the board’s “fiduciary” responsibility, the board must ensure that the organization is appropriately stewarding the resources entrusted to it and following all legal and ethical standards. The board should have more than the one annual meeting required by law. Most state laws require at least one annual meeting, but BoardSource believes that one meeting is insufficient for boards to provide proper oversight. The board must formalize a process for setting appropriate compensation for the executive and approve the compensation package. This ensures that the full board is confident that the executive is being appropriately compensated and that the organization is not opening the organization to the risks of excessive or inadequate compensation. The full board should review the Form 990 before it is filed. This ensures that board members are familiar with the information reported on the 990 and that it accurately reflects the organization’s financial and operating environment. The board must ensure that there are policies related to disclosing and managing conflicts of interest and that there is a strong whistleblower process in place. The board should ensure that an annual audit is conducted and that the board engages directly with the audit firm to discuss the results. But true oversight and accountability goes far beyond these core practices, and requires active engagement from each individual board member. BoardSource has a number of relevant resources, a few of which are listed below. 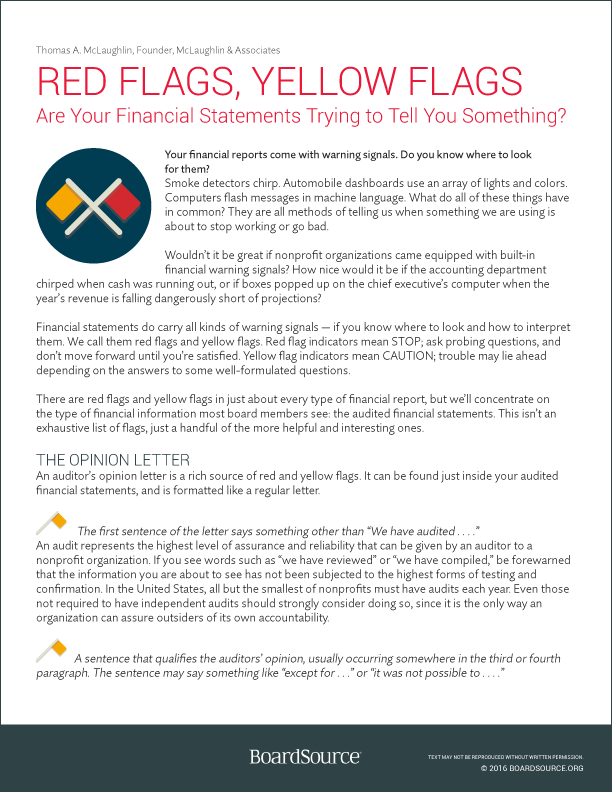 Red Flags, Yellow Flags: Are Your Financial Statements Trying to Tell You Something? 201 | Members only resource.Many nonprofit staffs send their organizational budgets to their boards for review and approval. Here are seven questions the board should ask before giving the budget a thumbs-up. 101| Community resource. For a nonprofit seeking tax exemption under Section 501(c)(3) of the Internal Revenue Code, getting it right the first time makes it possible to avoid onerous Internal Revenue Service (IRS) penalties associated with being categorized under an incorrect tax-exempt status. 201 | Members-only resource. Continual financial pressures, an increased demand for accountability, and the Sarbanes-Oxley requirements for publicly traded companies awakened many nonprofits to look at their own auditing procedures. 201| Members only resource. To avoid or diminish financial and accounting risks that might threaten the organization’s existence or decrease its effectiveness, the board needs to be aware of proper financial processes and practices. 201| Members only resource. The nonprofit board’s ultimate task is to assure that the organization adheres to appropriate standards, and that it functions within the framework of its stated mission. 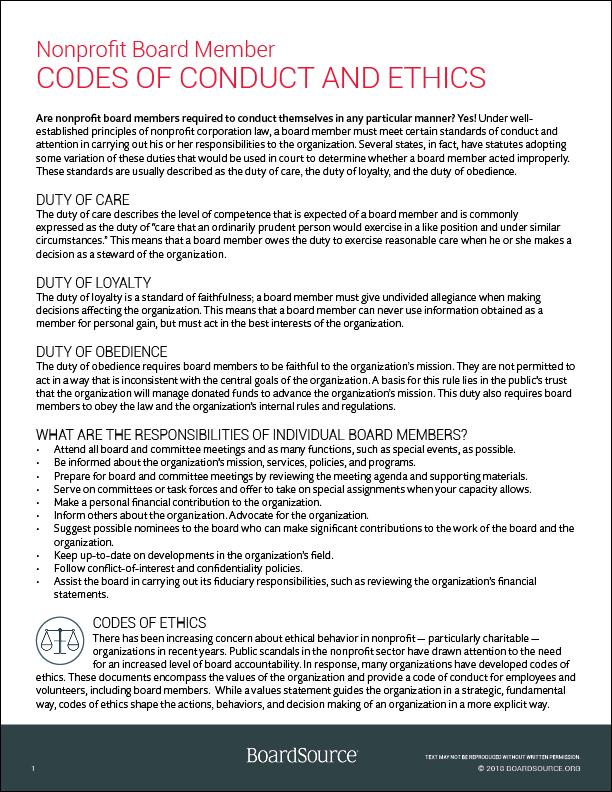 All board members have legal and ethical responsibilities to the organization and the community at large. Rarely do individual board members get sued for the malfunctions of an organization, yet it is important that every board member understands his or her responsibilities and that adequate precautions are taken. 101 | Community resource. 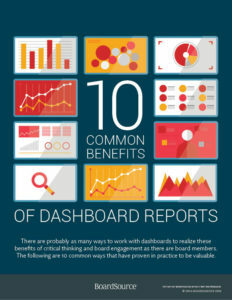 This resource provides an essential overview of dashboards, including what to consider before creating a dashboard and what dashboards can teach you about your organization. 201| Members only resource. Serving on a nonprofit board is usually a volunteer commitment. Offering compensation for board service raises issues that need to be studied carefully. There are circumstances where reasonable compensation is acceptable, but it is always critical that board service neither leads to personal financial gain, nor violates the public trust. 201| Members only resource. We often define individual independence as freedom from outside control or influence by others around us or having the confidence to act according to our own will. We can refer to the same definitions when we look at the independence of our organization’s board of directors or the individual board members composing the governing team, though it is not always straightforward. 201| Members only resource. In 2008, the IRS introduced a new Form 990. Most significant among the Form’s many changes was the IRS’s new interest in the governance practices of tax-exempt organizations. Nonprofits now must indicate which governance policies are in place and which processes define our boards’ oversight obligations. The answers to the posed questions are designed to illuminate the inner workings of tax-exempt organizations. 201| Members only resource. Should technical specialty be a necessary criterion for board service? In all-volunteer organizations, professional skills are particularly helpful. However, experts and representatives of specific fields can find themselves in a difficult position of trying to define their role as an active and contributing board member while being expected to perform professional services for the organization. 201| Members only resource. Whether drafting your organization’s first budget or a subsequent one, there are basic principles to follow. 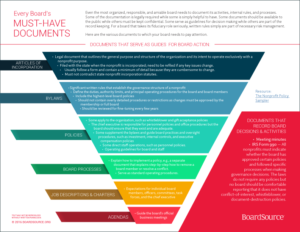 While budgeting is a staff function, your board must ultimately approve the final document. It is therefore important to keep the board informed and involved at the right points in the budgeting process. 101| Community resource. 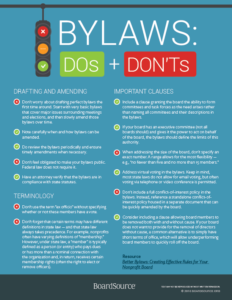 Bylaws are the legally binding rules that outline how the board of a nonprofit will operate. 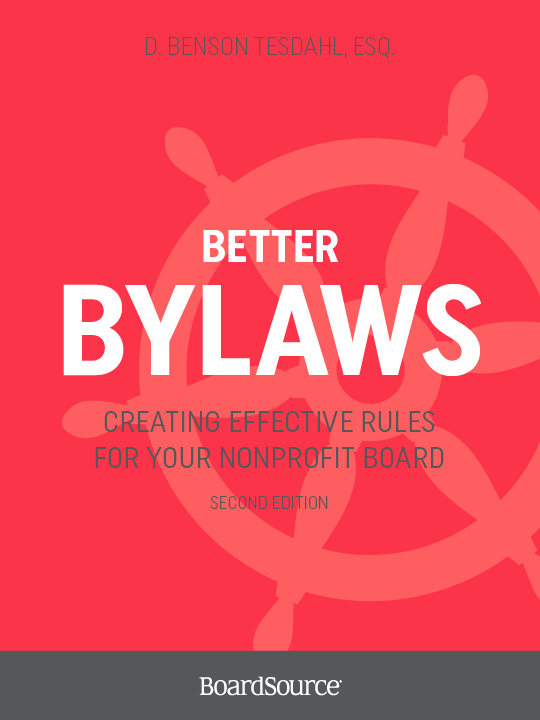 While they are unique to each organization, nonprofit bylaws generally have a similar structure and use. 201| Members only resource. Every tax-exempt organization cannot receive deductible donations, nor are all contributions automatically and fully deductible. This document explains how tax deductibility is calculated and provides information about charitable gifts that nonprofits must provide to donors. 201| Members only resource. Few of us would deliberately betray the confidence that our friends or family have bestowed upon us. There is an unspoken trust between ourselves and our confidants. Maintaining relationships relies on this trust. That expectation of trustworthiness is not limited only to our personal relationships. The same expectation expands to our business relations. That includes board service. 301| Members only resource. In private foundations, conflicts of interest occur when the financial or personal interests of board members or foundation managers are, or may appear to be, inconsistent with the interests of the foundation. Regardless of intention or result, however, foundations, their boards, and their managers must act very carefully when dealing with transactions that are, or may appear to be, inconsistent with a foundation’s interest for the following reasons. 101| Community resource. 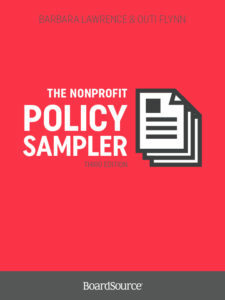 Creating nonprofit policies begins with knowing what they are. Policies are the operational guidelines for an organization. They are the protocol to follow that, when properly used, helps diminish embarrassing or potentially harmful situations, improper behavior, and ineffective decision making. An organization usually has board-related, personnel, and financial policies. 201| Members only resource. Every nonprofit struggles to balance its budget. Besides controlling its expenses, a nonprofit should also study closely its income options. Good financial management includes both monitoring expenses and exploring new opportunities for revenue. 201| Members only resource. All funders want their money to make a difference. When they perceive waste or lack of impact from their funding, they will be less likely to continue supporting the grantee. The board must take time to assess the organization’s needs and ensure appropriate overhead makes the best use of its financial resources. 201| Members only resource. 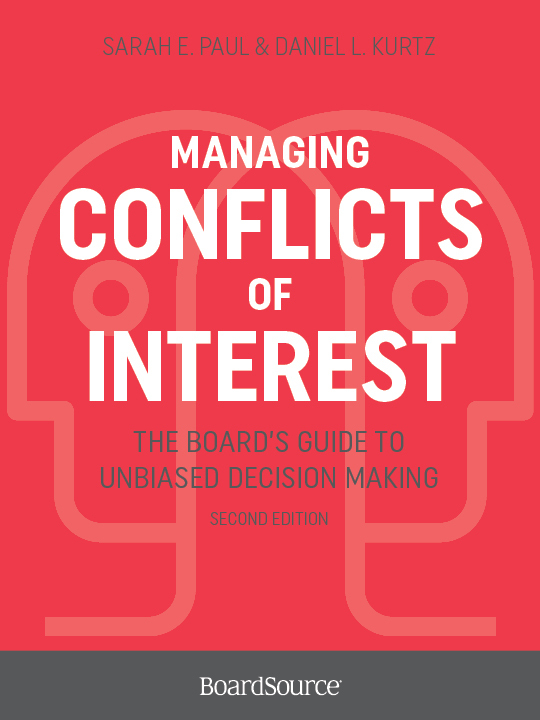 Without exception, every person associated with a nonprofit organization encounters a conflict of interest at one time or another. These situations are natural and cannot be eliminated when a dynamic, engaged individual is involved in activities where he or she has to weigh multiple options while keeping in mind the ultimate objective: to serve the good of the organization. 201| Members only resource. There may come a day in the life of every nonprofit when a difficult question must be posed: Is it time for us to close? For some, the final answer will be no, but asking the question may stimulate necessary changes. For many, the only honest answer will be yes. Do Nonprofits Need a Board? 101| Community resource. All nonprofits need a board. 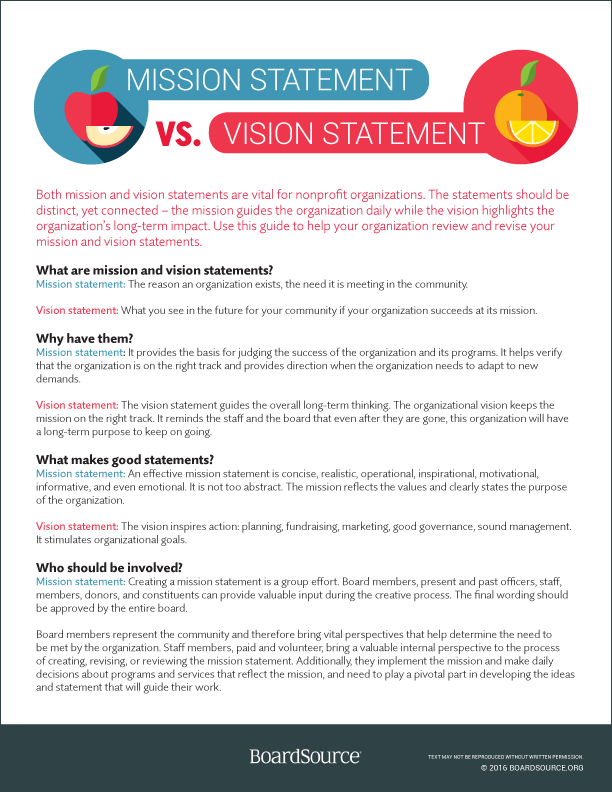 Although the specific responsibilities may vary due to mission focus and different phases of an organization’s existence, the basic role and purpose of all nonprofit boards remain the same. 101| Community resource. Is your organization governing green? Is it practicing good environmental stewardship? It’s up to the board to lead the way. 201| Members only resource. Being a legal entity, a nonprofit organization must realize that laws and regulations guide its activities and practices. There is no limit to the legal risks. 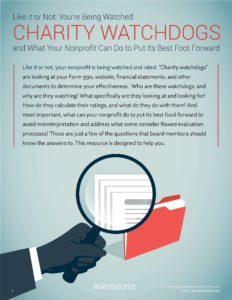 In fact, the abundance of risks can be troubling unless the leaders of the nonprofit are aware of organizational and board legal obligations, laws governing nonprofits, and internal protective measures that can prevent many unnecessary headaches or irreparable damage. 101| Community resource. Board members act as trustees of the organization’s assets and must exercise due diligence and oversight to ensure that the organization is well-managed and that its financial situation remains sound. Here is an outline of how board members can fulfill their role as fiduciaries. 101| Community resource. BoardSource has been answering governance-related questions posed by nonprofit leaders for more than 25 years. Here are our answers to some of the most frequently asked questions about financial and fundraising issues. 201| Members only resource. A rare nonprofit is able to continually do business as usual. Financial pressures are a daily reminder regardless the country’s general economic situation. 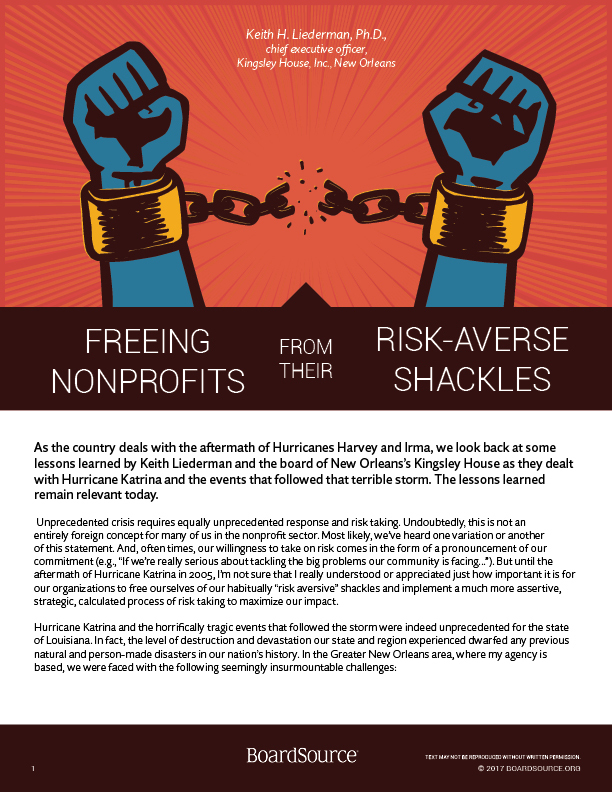 Here are some suggestions for struggling nonprofits and nonprofits that want to be proactive and avoid or prepare for potential hard times. 201| Members only resource. 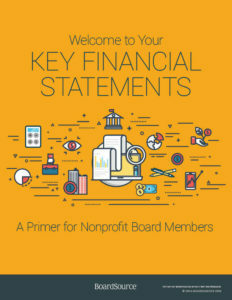 For many board members interpreting financial statements is a major challenge. Even when the statements are clear, timely, and comprehensive, it is not always easy to draw conclusions that correctly reflect the financial situation of the organization. 101| Community resource. Traditionally, fiscal sponsorship refers to an arrangement where an established nonprofit provides financial support for a project that may be independent or that yet has to obtain its own tax-exempt status. This is not to be confused with fiscal agency, where a nonprofit is retained as the legal agent to a project. In fiscal sponsorship, the relationship is the reverse: An established nonprofit takes a new project under its wings as an extension of its own charitable purposes. 301| Members only resource. All boards (even the most organized, responsible, and congenial ones) need to document their activities, internal rules, and processes. For a board that takes its fiduciary role seriously — and they all should — written rules and documentation of activities are simply part of ongoing, everyday risk management. 301| Members only resource. 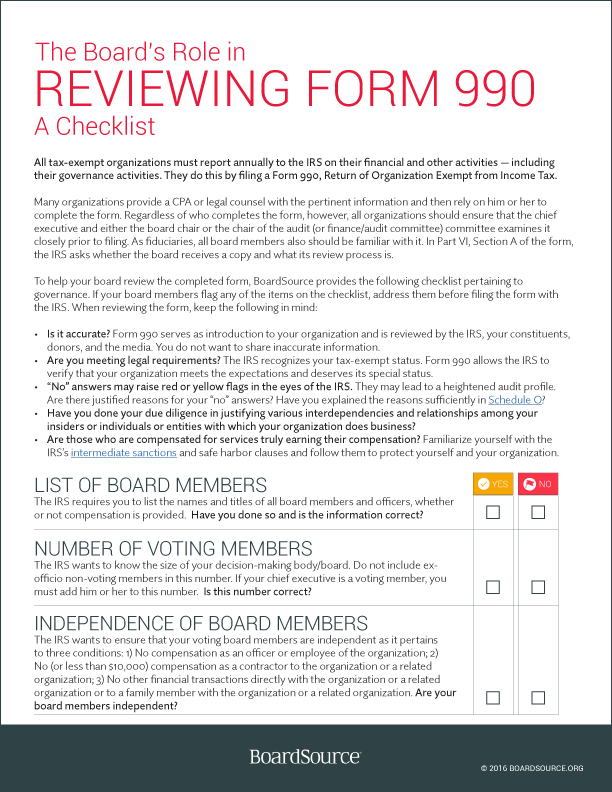 In this paper, we dissect the Form 990, focusing on the board and addressing only direct governance issues. Part VI of the Form is the key section for this purpose, though we do cover relevant topics that pop up in other sections of the Form as well. 201 | Members-only resource. Even though nonprofits and for-profit organizations function within different legal and economic frameworks, their boards have similarities in structure, concerns, and focus. They also have important differences. 201| Members only resource. Let’s face it: The world of commercial insurance is of little interest to the vast majority of nonprofit board members. Yet a board that pays scant attention to its organization’s insurance needs and arrangements unwittingly puts the mission of the organization at risk. 201| Members only resource. The IRS is paying attention to the financial transactions of nonprofits. It is important that those in positions of influence understand the implications of the regulations and realize how the organization and they personally can be financially affected. 201| Members only resource. The board is responsible for watching out for the safety and effectiveness of the organization. It therefore must ensure that all the necessary policies and processes are in place feeding into this objective — even if it is not directly involved in carrying out all the various activities. Internal controls — systems that guide behavior and action through checks and balances — form the key tools for the board’s oversight function. 101| Community resource. This paper is designed to help you decide whether your organization should apply for public charity or private foundation classification. 101| Community resource. BoardSource has been answering governance-related questions posed by nonprofit leaders for more than 25 years. Here are answers to the most frequently asked questions about nonprofit legal and compliance issues. 201| Members only resource. Numerous nonprofit boards find it highly desirable to recruit lawyers as board members. The expected role of the attorney is to keep the board aware of and in compliance with all the legal requirements that may affect its members as fiduciaries of the organization. 201| Members only resource. There are many types of planning techniques a nonprofit can use to try to become financially stable. More popular in the corporate sector, business plans are an often-overlooked practice for nonprofits. They make good business sense when crafted to test or start a new program, service, or a business venture. 101| Community resource. When starting a nonprofit, one of the first decisions is to determine whether to incorporate. Note that nonprofit incorporation is not the same as applying for a tax-exempt status. Both nonprofits and for-profits can incorporate. This outline discusses the basics of the nonprofit incorporation process and provides answers to common questions. 201| Members only resource. 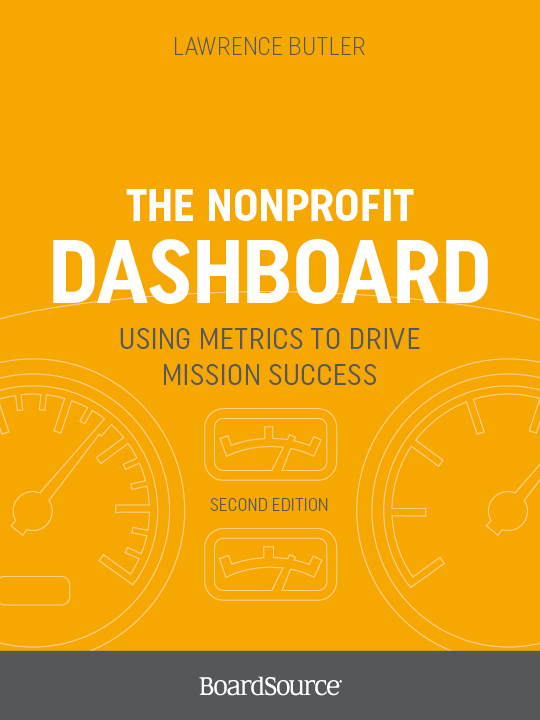 What is the optimal level of operating reserves for a nonprofit? There is no single answer that suits every organization. What is universal is that functioning without a reasonable buffer against unforeseen, seasonal, irregular, or exceptional cash shortages is not intelligent financial management. 201| Members only resource. 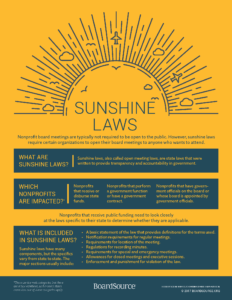 Most nonprofits are legally obligated to make certain documents available to the public. Accountability for a nonprofit means worthiness of public trust and fulfillment of qualifying factors for tax-exemption. 301| Members only resource. Nonprofits, like all businesses, have quite a bit of flexibility concerning the internal organization of their structures and processes. However, that flexibility is constrained by a myriad of agencies, governmental and otherwise; statutes; and individuals that regulate their activities and to whom they are accountable. 201| Members only resource. Managing difficult board members is one of the board chair’s toughest tasks. Differences of opinion are common but that is not a reason for removing a board member. However, a board member who is not able to fulfill his or her individual responsibilities, who does not abide by the rules set by the board, or who displays illegal and unethical behavior does not belong in the boardroom. 201| Members only resource. Risk comes in many forms — from a slippery sidewalk to a lack of internal controls — and its effects can be potentially devastating to an organization. However, risk can also create unanticipated opportunities. 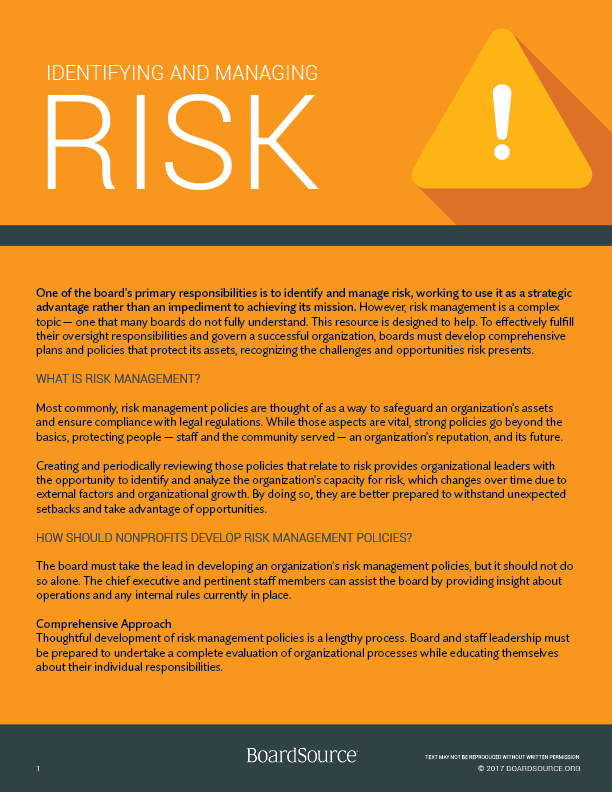 Viewing, analyzing, and managing risk from all angles places the nonprofit in a strategic position. 201| Members only resource. By creating a for-profit subsidiary, a nonprofit organization can achieve objectives that are difficult to pursue within the framework of its normal activities, mission, or legal status. The subsidiary is under the formal control of the parent organization. It is not a division, department, or a chapter but a separate organization. There are both tax-exempt and for-profit subsidiaries — here we focus on for-profit entities. 201| Members only resource. The board sits on top of the hierarchical pyramid of an organization, and in that position bears the responsibility for the health and secure future of the nonprofit. Board members must reconcile demands for accountability both as a collective group and as individuals. 101 | Community resource. With effective policies and procedures, a board can be very active in supervising investments while still delegating authority, encouraging teamwork and community spirit, and articulating a common vision. 101 | Community resource. In this article, Jeanne Bell, CEO of CompassPoint Nonprofit Services, explains the concept of nonprofit sustainability. She suggests five actions to help ensure nonprofit boards are focused on programmatic sustainability as part of their financial oversight. 301| Members only resource. The Sarbanes-Oxley Act was signed into law on July 30, 2002. Passed in response to the corporate and accounting scandals of Enron, Tyco, and others of 2001 and 2002, the law’s purpose was to rebuild public trust in America’s corporate sector. 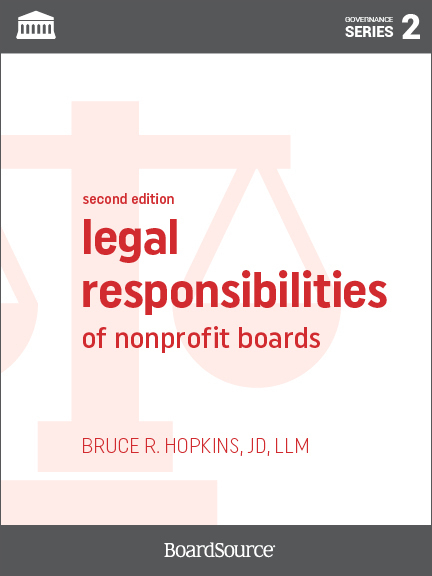 The following sections cover each of the major provisions of the law and discuss their relevance to nonprofit organizations. 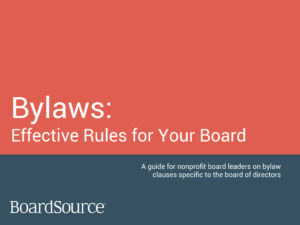 In addition, BoardSource and Independent Sector offer recommendations for how nonprofit leaders should implement various provisions of the law. 201| Members only resource. Every nonprofit is encouraged to function in a glass house. 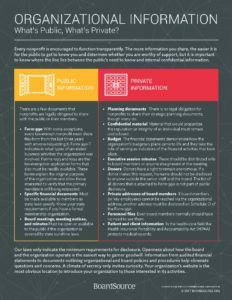 The more information it shares, the easier it is for the public to get to know it and determine whether it is worthy of support. At the same time, indiscriminate openness can also backfire. It is important to know where the line lies between the public’s need to know and internal confidential information. 201| Members only resource. A nonprofit plans its activities and establishes new programs within the scope of its mission. However, to enhance its income flow, a nonprofit may undertake business activities that are not substantially related to its core purpose. 201 | Members-only resource. Nonprofits must be able to cope with an impending deficit when a major funder announces that it will no longer provide operational support. 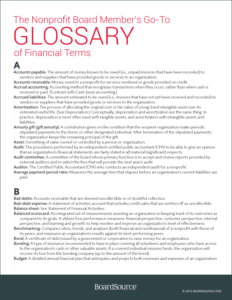 This resource explains common terms for grants, reasons funders might cut funding, and exit strategies for funders and recipients. 201| Members only resource. Every nonprofit must clarify how the board and the staff interact when handling the financial issues affecting the organization. Solid job descriptions, appropriate policies and procedures, and a system of checks and balances will ensure that the financial management and oversight are in good hands. 201| Members only resource. Even the most stringent risk management policies and procedures do not provide adequate protection against liability in legal actions. Here are some common questions posed by board members concerning liability insurance and appropriate coverage for their nonprofit organizations.